"Best brine for smoked turkey around. This recipe was given to me by my uncle. He is always smoking meat. EDITOR'S NOTE: This recipe uses canning or kosher salt, not table salt. Using table salt in this amount will make the brine too salty." In a food-grade large bucket or container large enough to hold your turkey, mix together the water, salt, garlic, pepper, Worcestershire sauce and brown sugar. 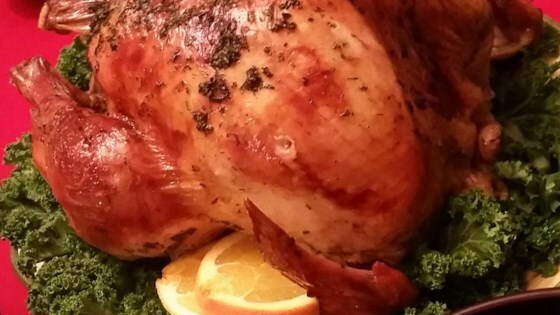 Store in a refrigerator, and soak turkey for 2 days before smoking or roasting. Brining your turkey preps it perfectly for smoking or roasting. Always brine foods in a food-grade, nonreactive container such as a stainless steel or enameled stockpot, a brining bag, or a food-grade plastic bucket. Never use ordinary trash bags, plastic trash cans, or metal buckets or containers not meant for food use.